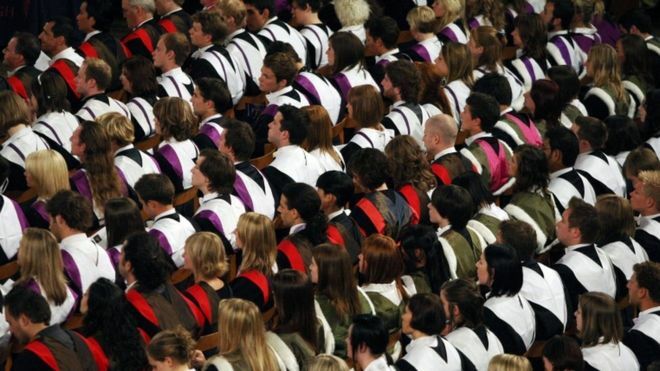 The number of people in higher education in Scotland exceeded 235,000 last year, as student numbers rose. New figures reveal there was an 1% increase in both UK and EU students at Scottish institutions in 2015/16. There was also a 3% rise in the number of international students from non-EU countries, according to the Higher Education Statistics Agency (Hesa). Experts said it was testament to the “world-class reputation” of Scotland’s universities. The report found that: There were 235,565 enrolments at higher education institutions in Scotland in 2015/16 A total of 184,630 students came from the UK, while EU students totalled 20,945 94% of first year undergraduates from Scotland chose to study north of the border The largest number of non-EU undergraduates came from China and their number rose by 2% last year They were closely followed by the Americans – student numbers rose by 8% in 2015/16 The largest number of EU student enrolments came from Germany, with numbers increasing by 7% Irish students made up the second largest number of EU undergraduates but their numbers fell by 11% However Alastair Sim, the director of Universities Scotland, warned that the number of Indian and Nigerian students had also fallen significantly. The figures were revealed after an all-party parliamentary group at Westminster was told that Indian students were choosing Australia over the UK. Mr Sim said: “These are welcome figures for Scottish universities from Hesa given the context our universities are currently recruiting in. “Overall, non-EU student numbers are up 3% to 29,980 with Chinese and American student numbers up 2% and 3% respectively.